Vargrav is the project of sole member V-KhaoZ, a Finn who’s been involved in more bands than I can count. This is one of the more recent ones, with “Netherstorm” being the debut and released in the dying days of 2017. Vargrav sits firmly in the “symphonic” black metal category, but before you wrinkle your nose in disgust, hold up. Keyboards in black metal is cause for apprehension for many, and for good reason – the abuse of keyboards in black metal has reached absurd levels in the past, with bands being content to drown everything in synth and thinking “lol we’re Emperor!” These bands, of course, completely missing the point of what made early Emperor so brilliant to begin with. Enter Vargrav, who athletically dodge this bullet; “Netherstorm” likens to “Nightside”-era Emperor and fully understands that it was the god damned riffs that made that album what it was, with the keyboards used for emphasis rather than direction. 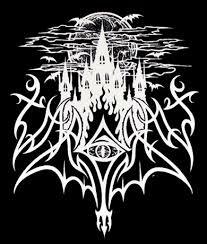 So, with that said, Vargrav is symphonic black metal, but done tastefully – nay, properly. Vargrav honours pioneering bands in this style, and successfully pulls off an album that would be in good company with second wave luminaries like early Emperor, Limbonic Art or Obtained Enslavement. “Netherstorm” cranks out five tracks (plus an outro) of majestic black metal heavy on ambience. An icy guitar tone is able to remain full and vibrant as it weaves through epic, fantastical riffs backed by furious drumming. Vargrav deliver their opus dynamically and with emotional diversity – keyboards constantly lurk around, subtly adding to the grandiosity of the song and occasionally taking the forefront for dramatic flair, but no matter what they’re doing, they’re never allowed to take over the song from the towering, memorable riffs. Tracks like ‘Limbo of Abysmal Void’ puts epic riffage at the forefront and are perfects example of how to incorporate keyboards to complement the black metal storm rather than compete with it for attention. Special mention to the dreamlike ‘Obedient, Tolerant, Ensnared,’ which is a brilliant and sorrowful end piece that hearkens back to Gehenna’s fantastic black metal era. “Netherstorm” works extremely well on practically every level and it’s one of the best albums I’ve heard in this style in recent memory. I’ll be following them closely and can’t wait for their next chapter. Highly recommended.